PART FIVE: Resolutions you can keep! Step 3: Write down a plan for achieving your written goals. Now that you have a few specific, positive goals on paper, you need a strategy for making them happen because a goal without a plan for achieving it is just wishful thinking. Missing this step, especially if you have a big goal, is why I think many, many people fail at their resolutions and become cynical about New Year’s. The problem isn’t a lack of motivation. It’s not that our goals are too big. And it’s not that we make bad resolutions. People have the best intentions but no plan for how to fulfill them. Your goal may be to reach your ideal weight by losing 30 pounds in 2012, but how are you going to lose those pounds? 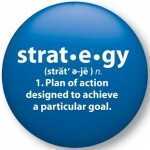 What is your strategy? You’ll recall that my goal in 2006 was to write a book. That’s a pretty hefty project requiring months of work. Without a plan for accomplishing my goal, I could very easily have reached February with little or no progress, decided that writing a book was just a childish fantasy anyway, and given up on my goal. So I devised a plan for achieving my goal: I would write 500 words a day until the thing was done. Now, did I stick to that plan? Often, no. I discovered quickly that writing 500 words a day was easy; writing 500 words a day worth publishing was difficult. But, having a clear strategy for making progress kept me on target. A little a day would equal a whole in the end. Now I had a goal, and I had a plan for making it happen. All done, right? Not quite. One more step to go. Come on back now, ya hear?